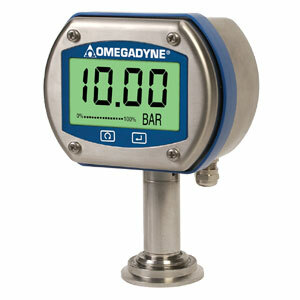 OMEGA's DPGM409S Sanitary/ CIP digital pressure gauges with metric ranges incorporates a rugged 316 SS enclosure designed for washdown and marine applications with a precision 0.08% accuracy pressure transducer with 316L SS wetted parts and body. The result is an extremely durable digital pressure gauge designed to survive harsh industrial environments. The large 25 mm (1") display is easy to read at a distance up to 11 m (36'). Models are available in gauge, sealed gauge, compound gauge, absolute, vacuum and barometric pressure ranges. Standard features include a highly stable silicon sensor, selectable MIN/MAX and AVG readings, Hi and LO alarms and an externally powered user selectable analog output. An optional wireless transmitter feature with software allows the signal to be transmitted to a remote location such as a PC for charting and data logging. Power is from an internal long life battery (included) or an externally supplied dc voltage source. Each unit offers free downloadable configuration software that allows the user connect to a pc via a standard USB connection (cable included) and select a variety of user configurable features including update rate, dampening, units, backlight and auto off. The analog output can also be independently scaled from the display. Note: Compound gage ranges have a unidirectional analog output equal to their full span; i.e. -1 to +1 bar = 0 to 10 Vdc. Overrange Indication "_ _ _ _"
注: Comes complete with operator’s manual, free downloadable set-up and configuration software, magnetic stylus, USB cable, 2.7 m (9') analog output cable with ferrite core, one 3.6V lithium C cell battery (two with wireless option) and 5-pt NIST traceable calibration. Wireless option also includes charting and databasing software. For wireless option add “-W” suffix for additional cost (includes data logging and graphing software).